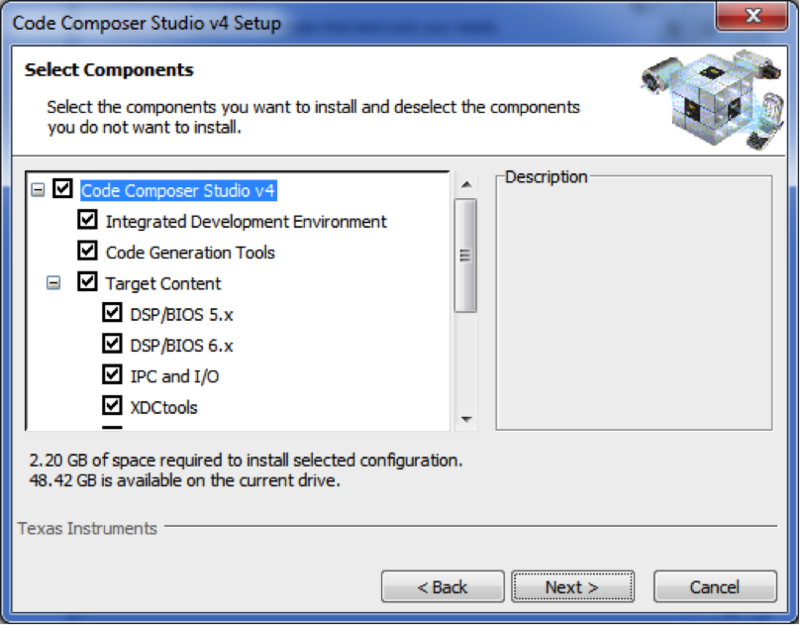 Download a free copy of Code Composer Studio v4. You can run this free copy for 30 days before you need to purchase a license. Download the TMS320C6000 Chip Support Library (CSL). No license is needed for this. Download the C6713DSK Board Support Library (BSL). No license is needed for this. In Windows 7, you should turn off UAC before proceeding. You can turn UAC on again after the install is complete. To turn off UAC, follow this procedure (option A). You may need to restart the computer. 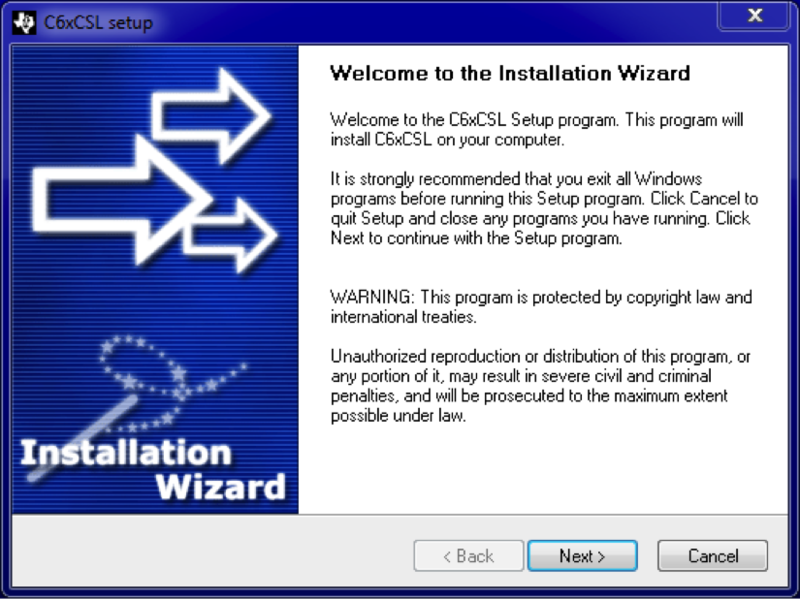 Double click on the installation file "setup_CCS_4.2.4.00033.exe" (your version number might be different) to begin the installation. You should see the welcome screen. You will now see the License Agreement page. 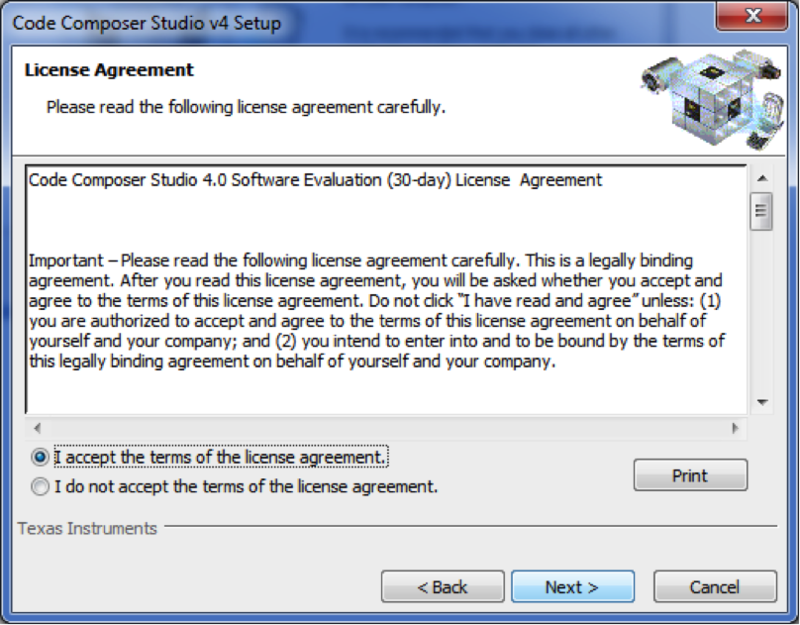 Check "I accept the terms of the license agreement" and click "Next". You can now choose where to install CCS v4. Just go with the default and click "Next". 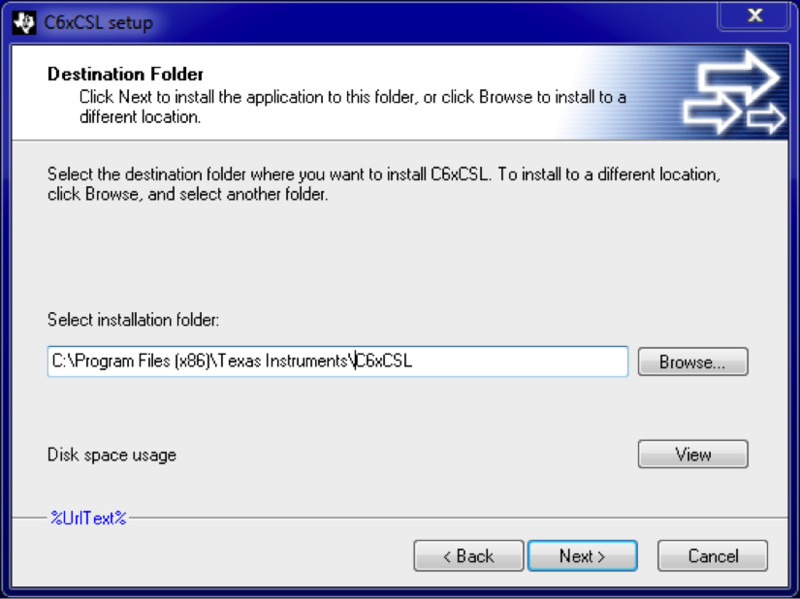 Note: If you have a 64-bit install of Windows 7, the default location will be "C:\Program Files (x86)\Texas Instruments", otherwise it will be "C:\Program Files\Texas Instruments". You may get this window about default user privileges. 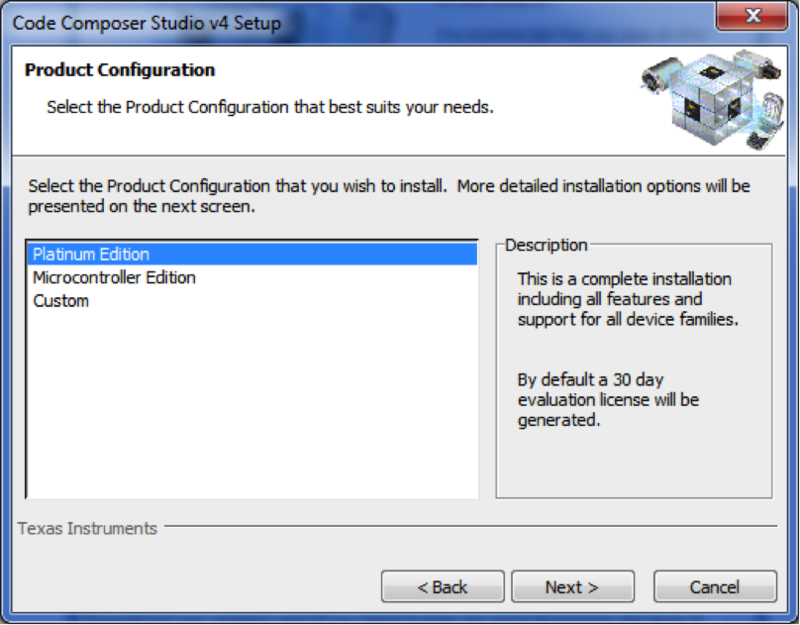 You now need to select the product configuration. Select "Platinum Edition" and click "Next". You now need to select the ISA support to be installed. You can probably get away with just selecting "C6000 DSPs" and clicking "Next" (this will probably save some install time and some disk space), but I've always left everything selected. You now need to select components to be installed. I've always left everything selected and clicked "Next", but you might be able to uncheck some items here if you are sure you won't need them. The installer will now allow you to review the settings before committing to the install. If this looks correct, click "Next". 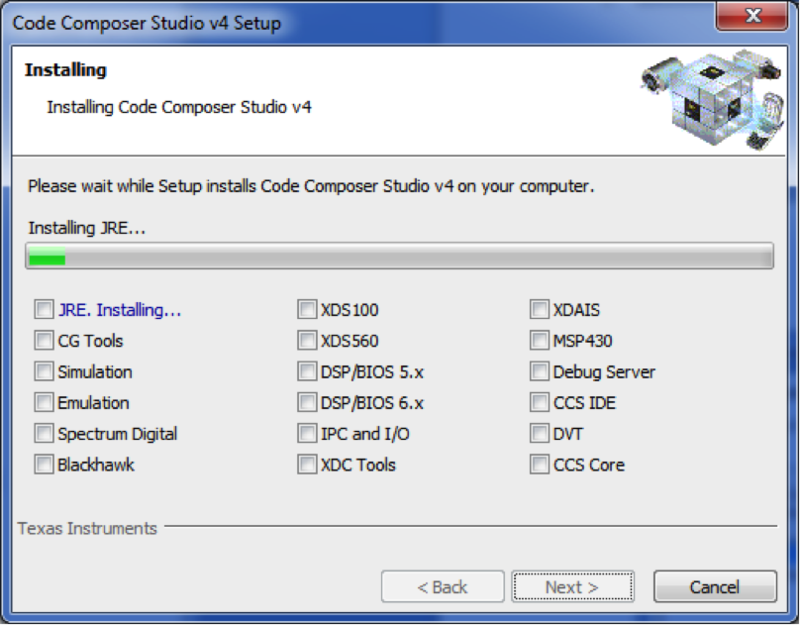 This is what it looks like when it starts installing CCS v4. This could take a while, so go for a walk. While installing the Spectrum Digital components, you may see this message from Windows. Check "Always trust software from Spectrum Digital" and click "Install". These drivers must be installed to work with the C6713 DSK. You may see this message from Windows. Check "Always trust software from EWA Technologies, Inc" and click "Install". I don't think these drivers are really necessary for working with the C6713DSK, but I haven't tested the install without them. 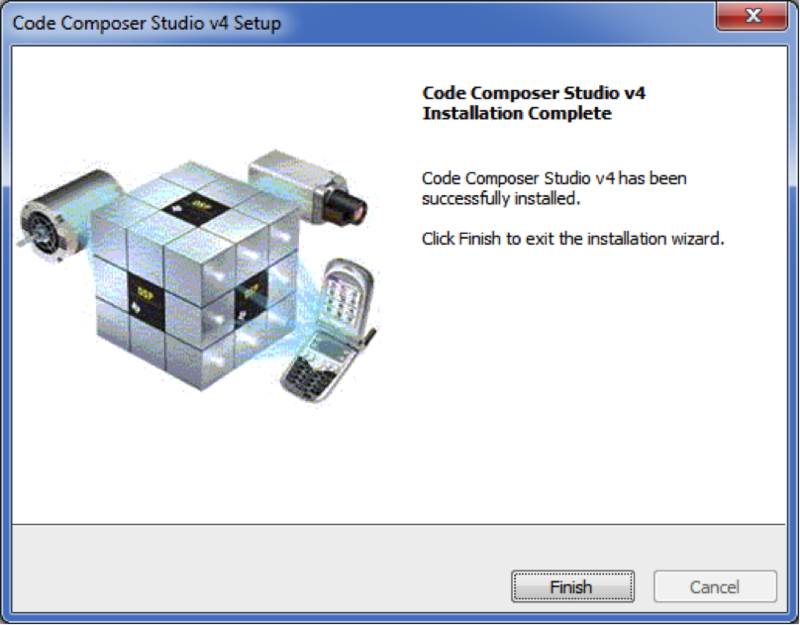 This is what it looks like when it finishes installing CCS v4. Click "Finish". Congratulations. You can delete all of the icons it put on your desktop (keeping the CCS v4 icon for convenience) and now move on to installing the chip support libraries. Chip support libraries for the C6000 family of DSP chips are not included with CCS v4. 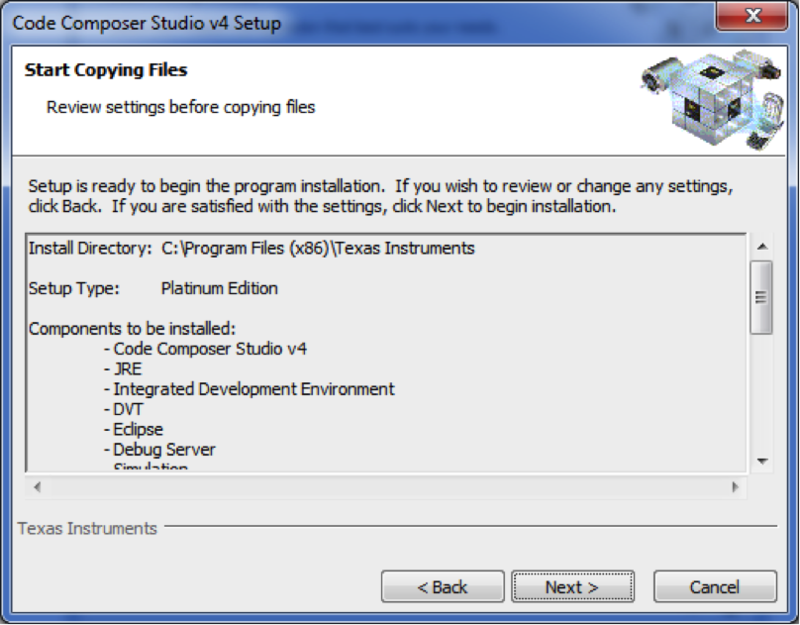 To install the chip support libraries, double click on the installation file C6000.exe. You should see the welcome screen. 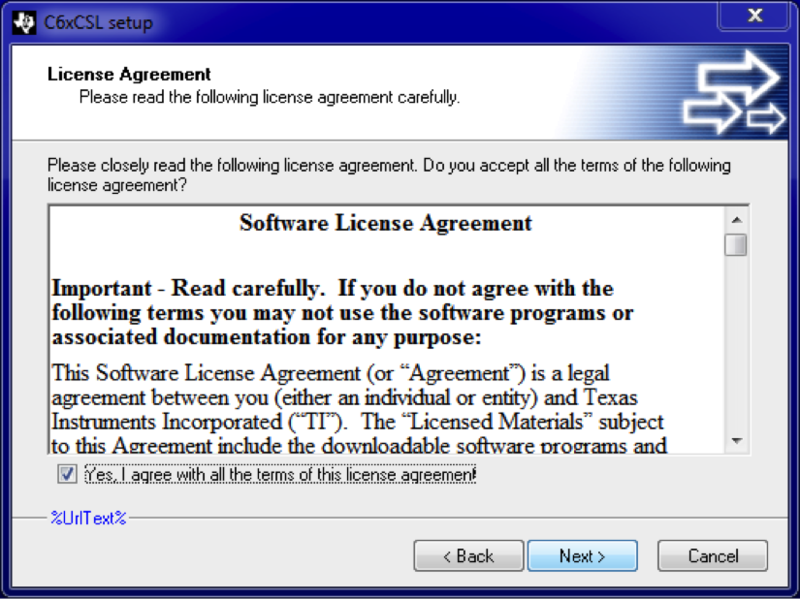 Check "Yes, I agree with all the terms of this license agreement" and click "Next". 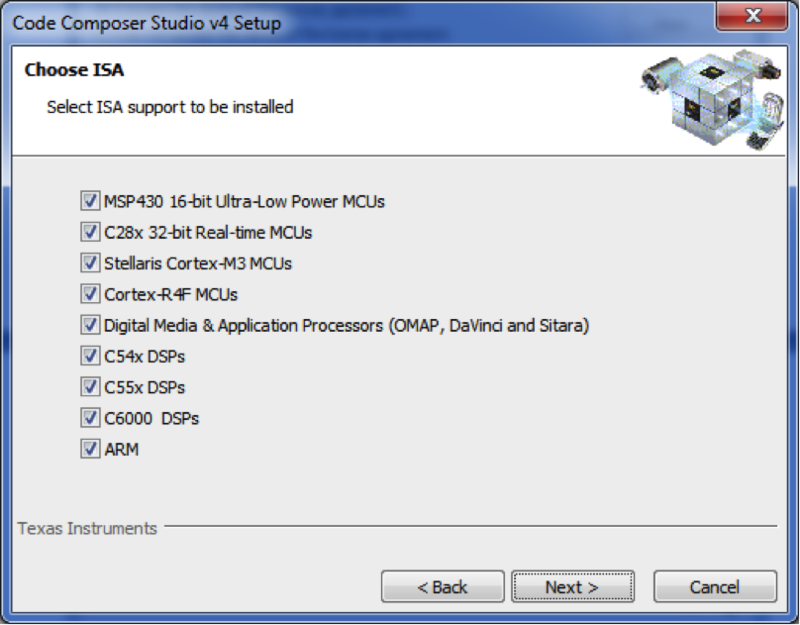 You can now choose where to install the chip support libraries. I prefer to not use the defaults here. 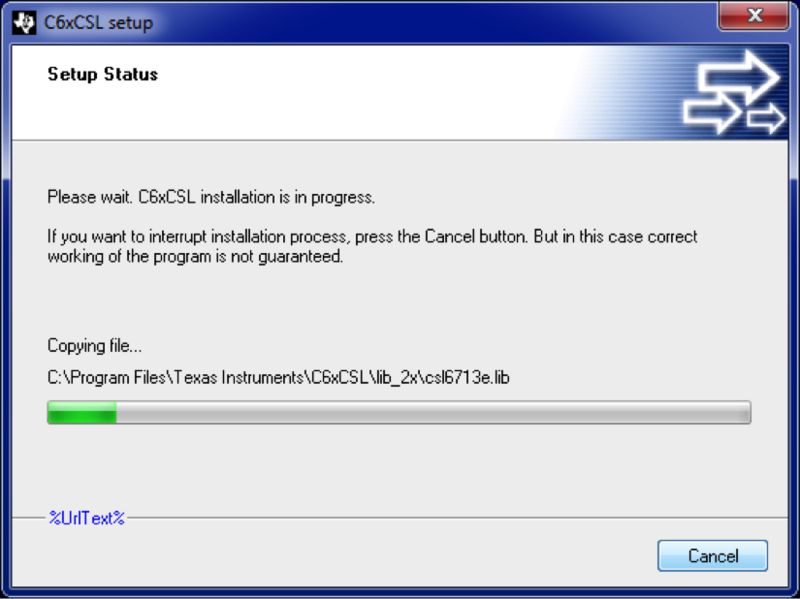 Since I installed to a 64-bit version of Windows 7, I went with "C:\Program Files (x86)\Texas Instruments\C6xCSL". 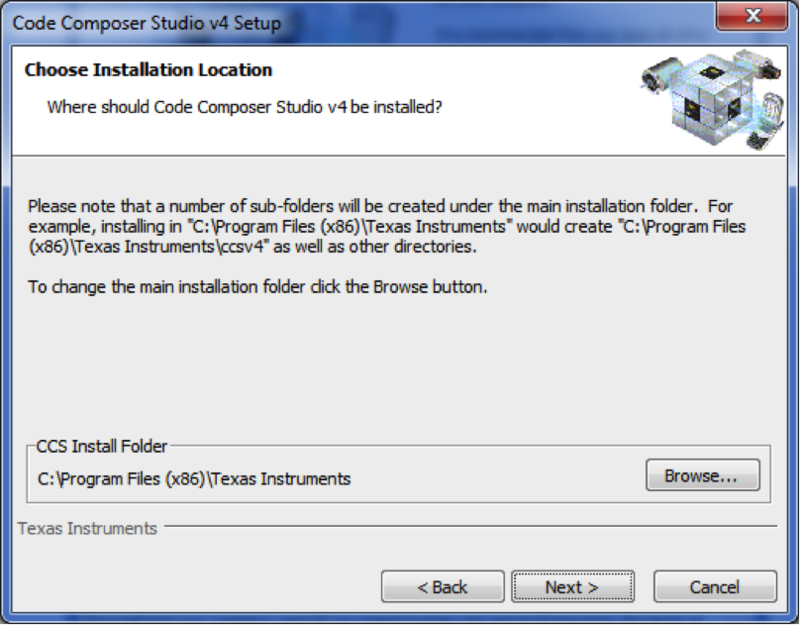 If you are installing to a 32-bit version of Windows 7, you will probably want to go with "C:\Program Files\Texas Instruments\C6xCSL". 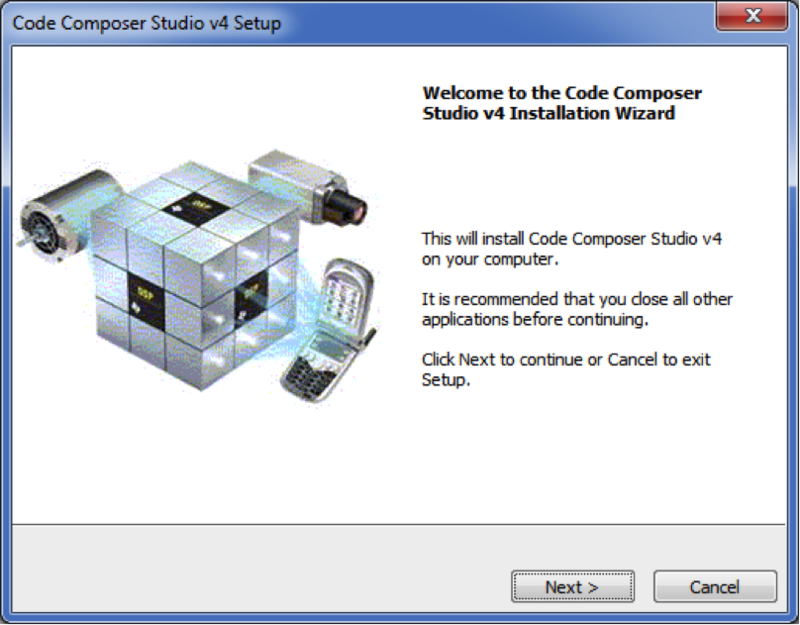 The installer will now allow confirm that you want to proceed with the install. 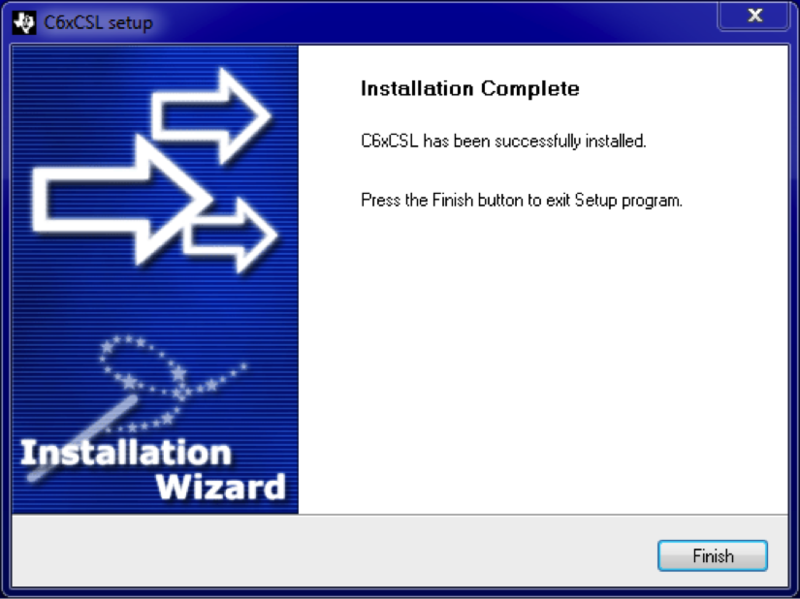 This is what it looks like when it starts installing the CSL. It shouldn't take very long. This is what it looks like when it finishes installing the CSL. Board support libraries for the C6713DSK are not included in CCS v4. These libraries are necessary to use specific DSK functions like reading the DIP switches, turning on/off the LEDs, and reading/writing the AIC23 codec. To install the board support libraries, first unzip the DSK6713.zip file to produce a folder called "DSK6713". This folder should have subfolders "bin", "c6000", etc. 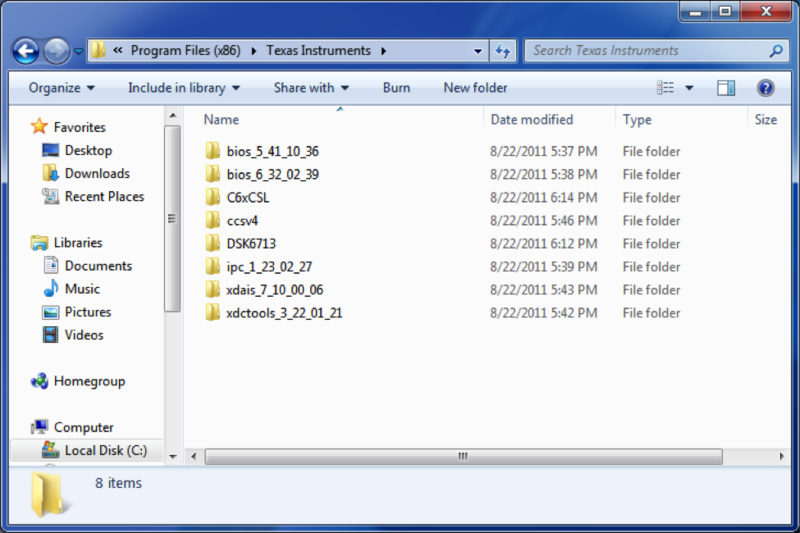 Drag this folder to "C:\Program Files (x86)\Texas Instruments" (or, if you are using a 32-bit version of Windows 7, "C:\Program Files\Texas Instruments"). This is what it should look like when you've put the board support libraries in the right place. It isn't actually necessary to put the BSL in this location, but I will assume that the BSL is here for all of the assignments and examples in ECE4703. 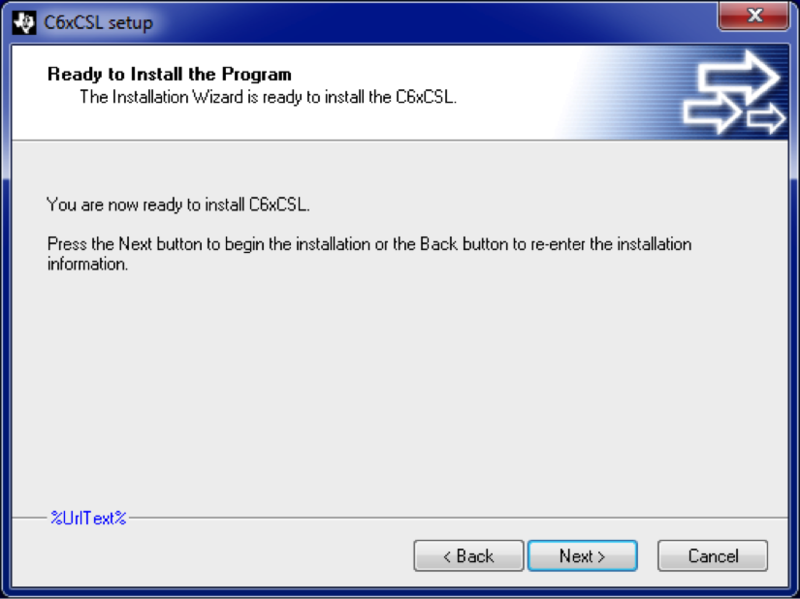 You are now done installing CCS v4 and all of the necessary libraries to work with the C6713DSK. You can turn UAC back on now and go on to configuring CCS v4 to work with the C6713DSK.